1. 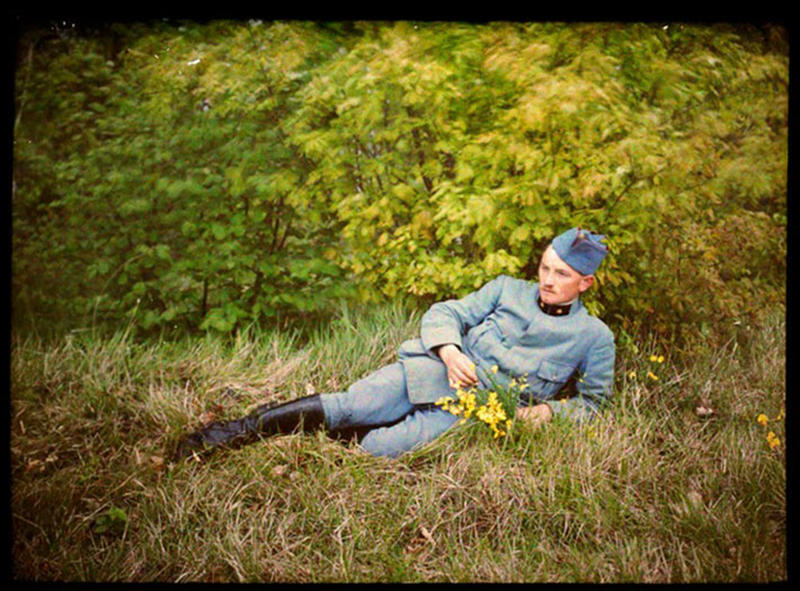 A French soldier, 1915. 2. 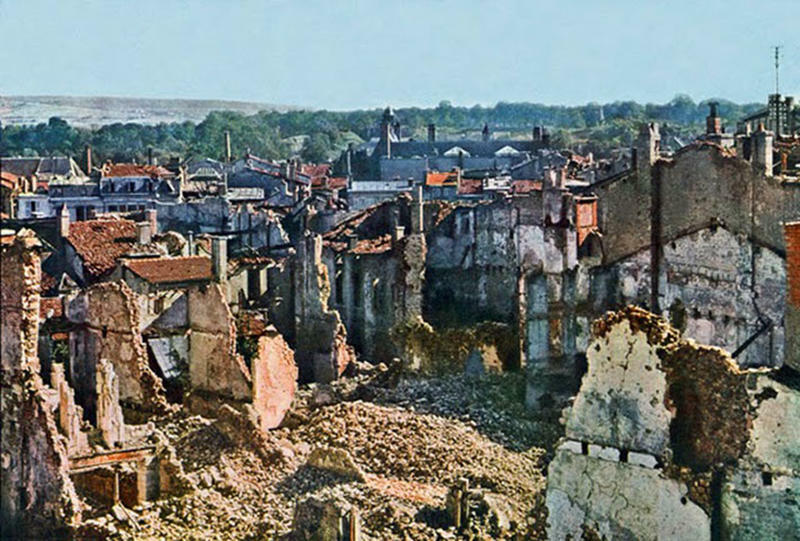 Verdun after 8 months of relentless bombing, September 1916. 3. 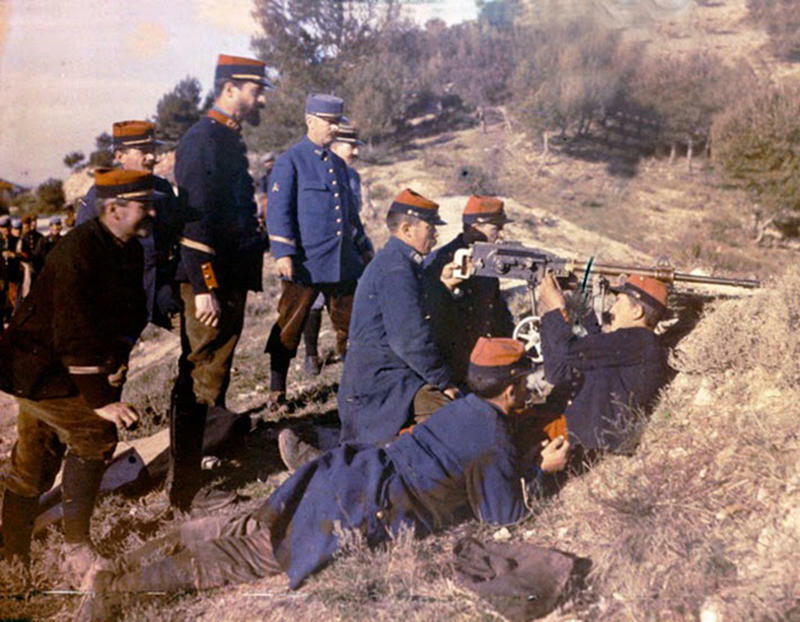 French Gunners given instruction, 1916. 4. 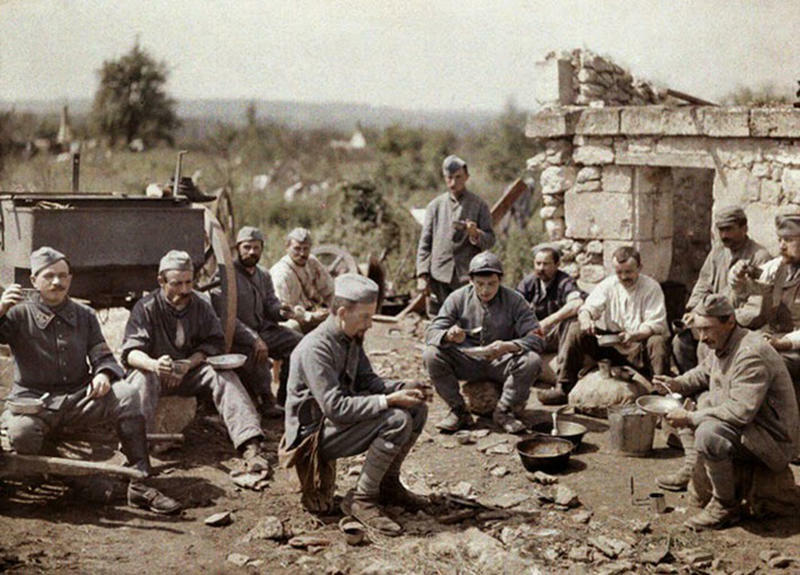 French soldiers of the 370th Infantry Regiment eating soup during the battle of the Aisne, 1917. 5. 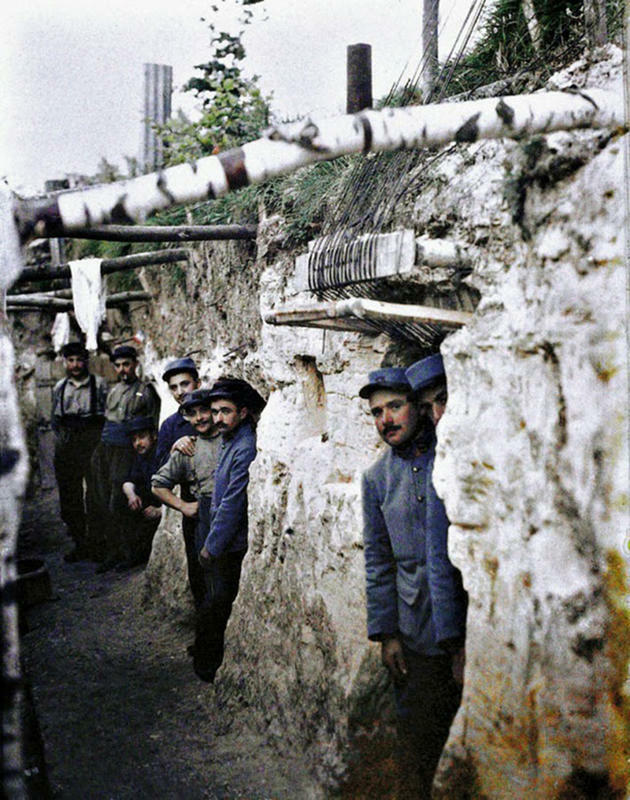 French Artillery soldiers standing at the entrance of their shelter on the Western Front. 6. 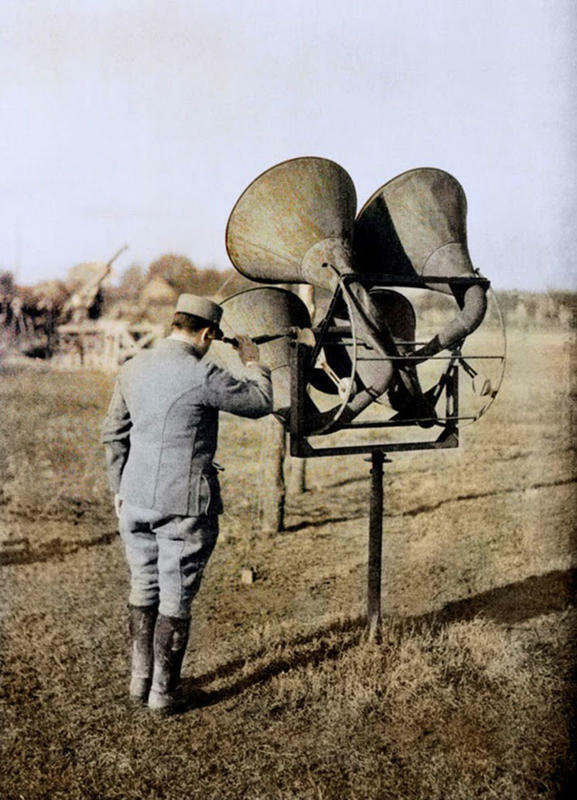 A French soldier with a listening on a device capable of tracking aircraft on the Western Front. 7. 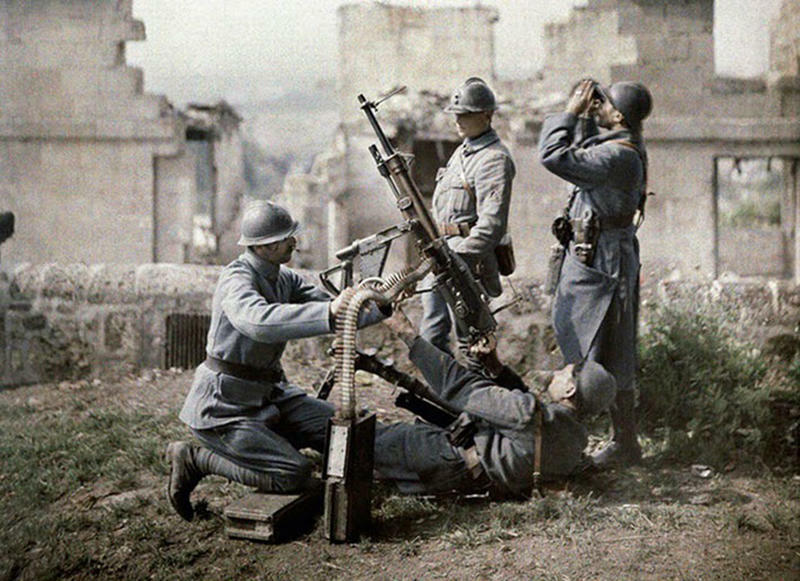 Machine gunners during the battle of the Aisne, 1917. 8. 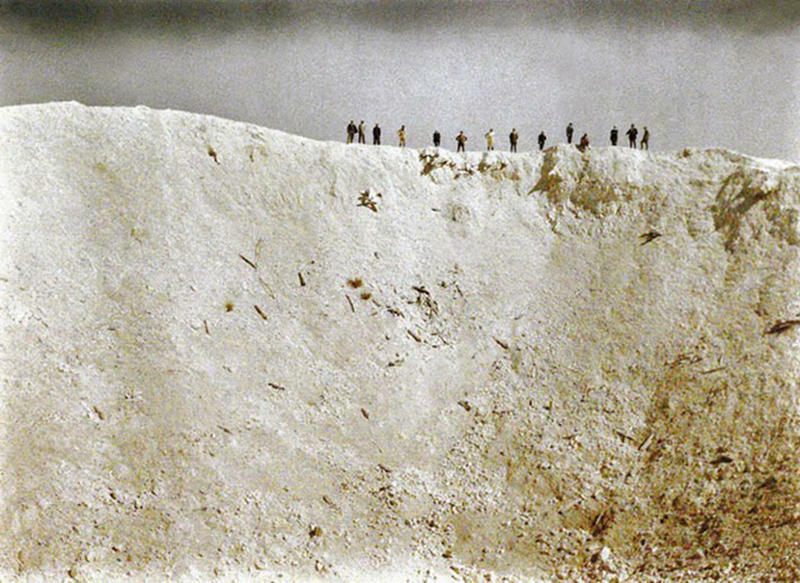 A massive crater caused by the explosion of 19 mines placed underneath German positions by the British, near Messines in West Flanders, June 7, 1917. 9. 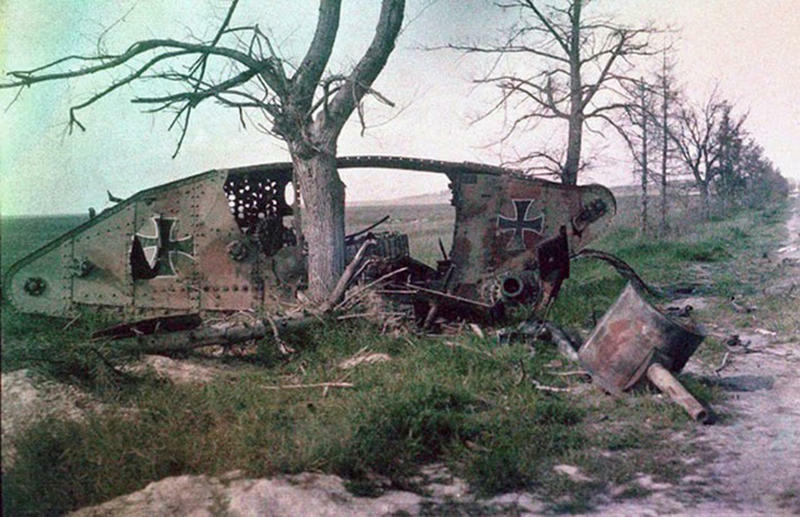 The wreck of a German tank destroyed during a battle on the Western Front. 10. 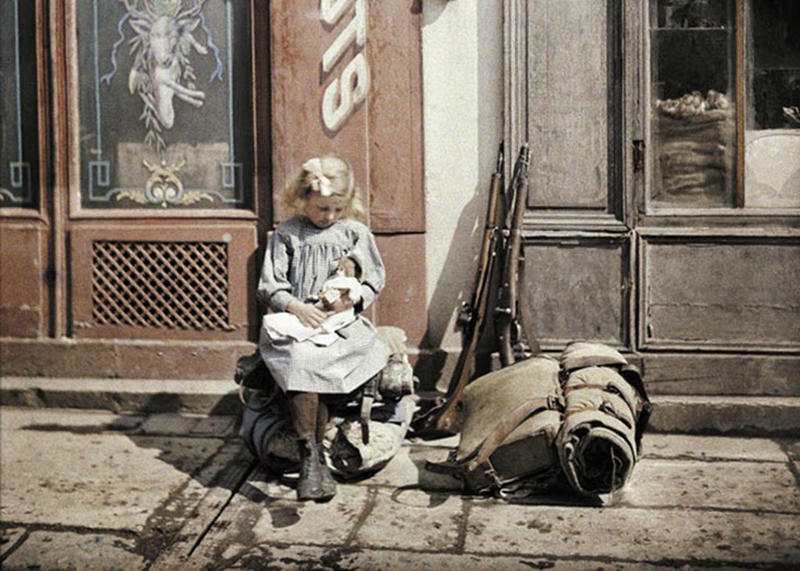 A little girl plays with her doll in Reims, France, 1917. 11. 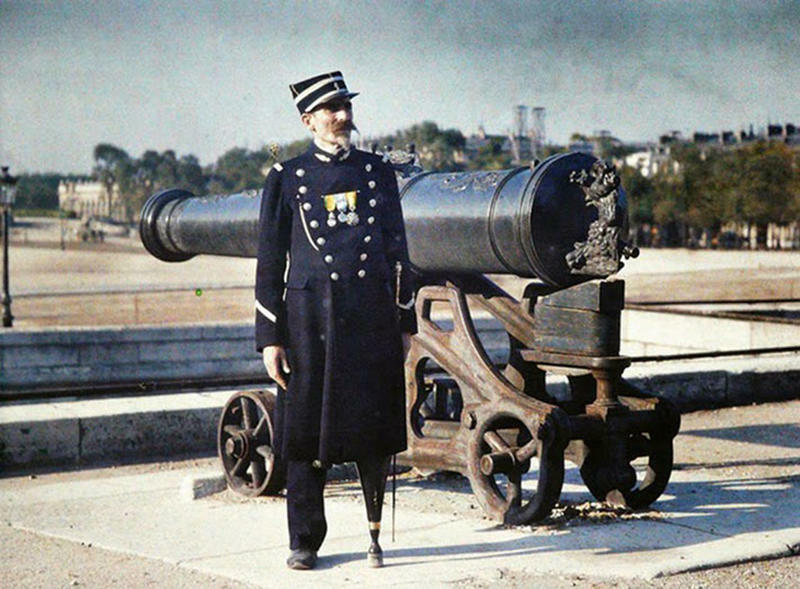 A soldier in uniform with three medals poses next to a cannon in Paris, 1918. His left leg has been replaced by an artificial limb. 12. 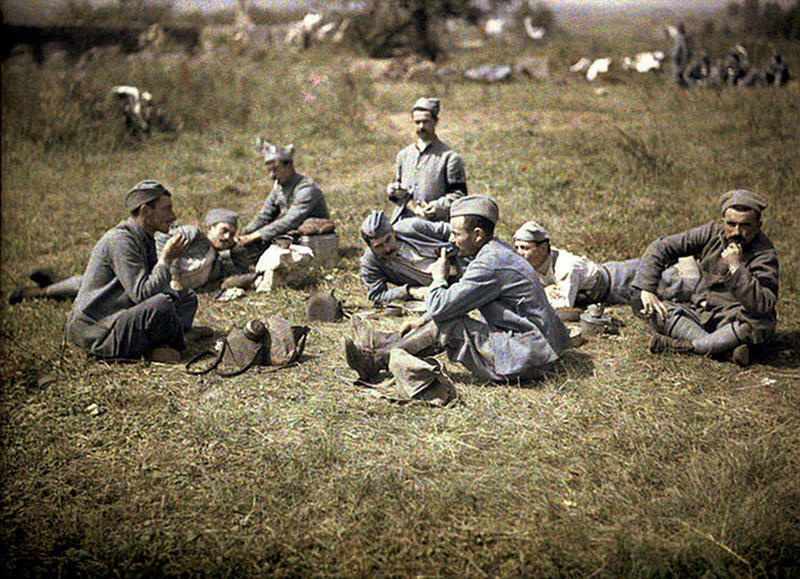 French soldiers resting in the grass after lunch on the Western Front in Aisne, France, in 1917. 13. 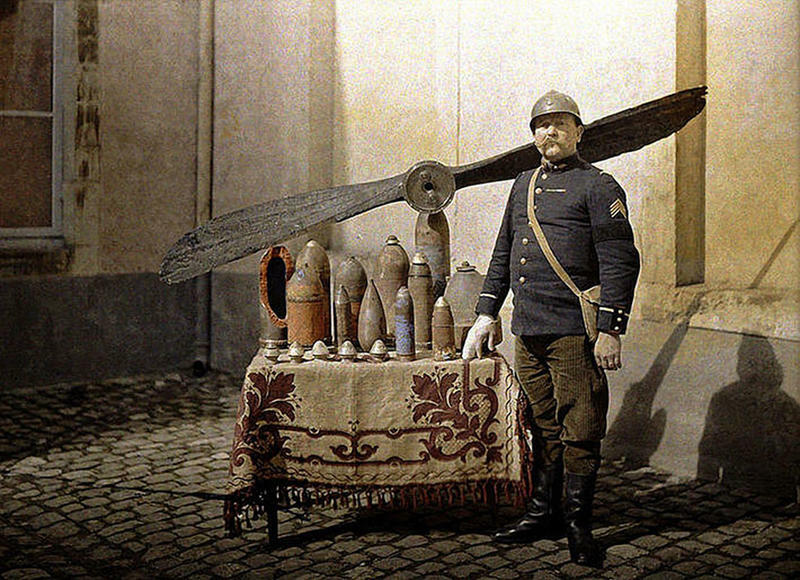 A French soldier poses next to a table with German shells and an aircraft propeller, along the Western Front in Reims, 1917. 14. 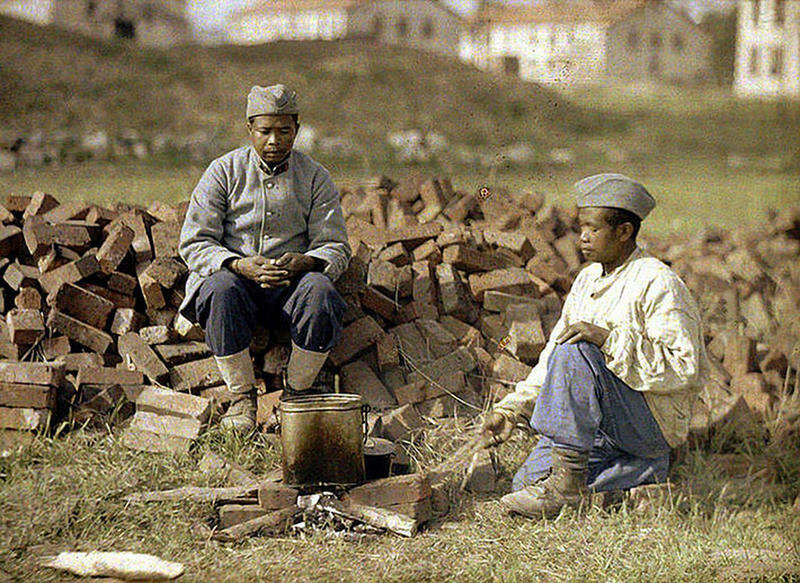 Two French soldiers from Africa cooking a meal on an outdoor fireplaceon the Western Front, 1917. 15. 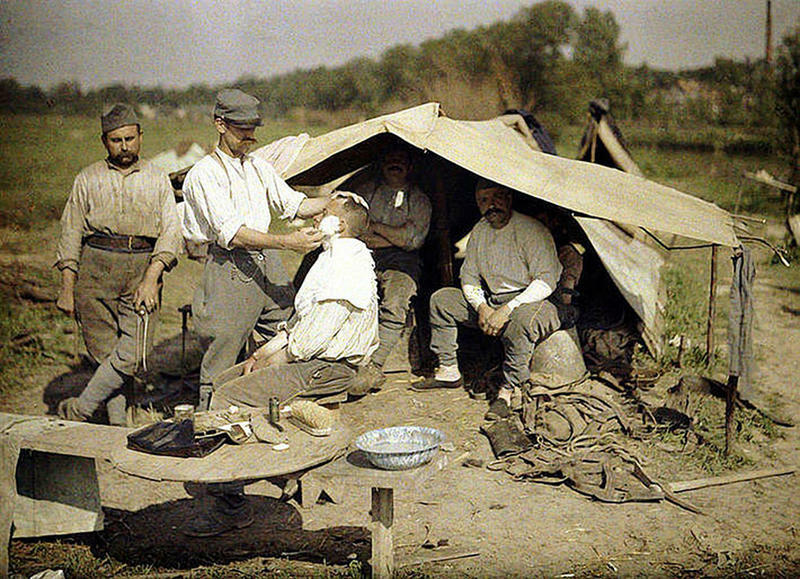 A soldier getting a shave in a French military encampment in Soissons, 1917. 16. 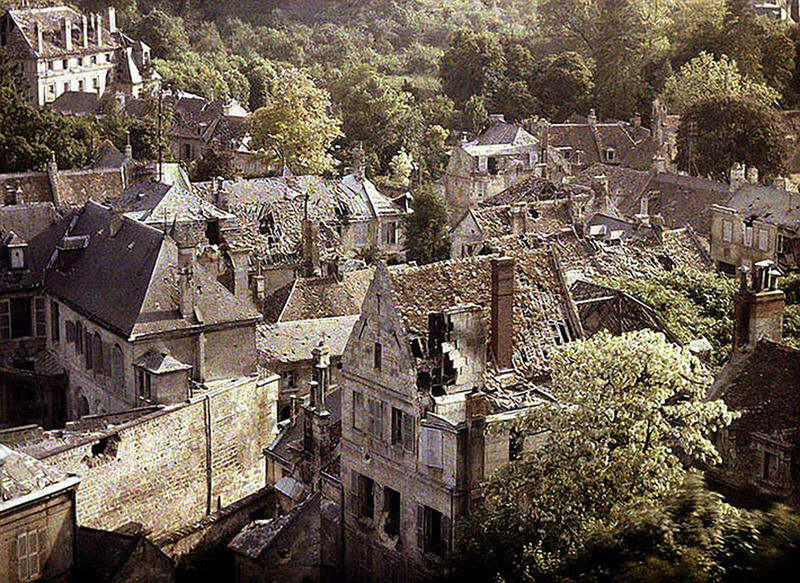 The town of Soissons in Picardy in northern France was taken over by German troops twice during WWI and was heavily damaged by artillery fire. 17. 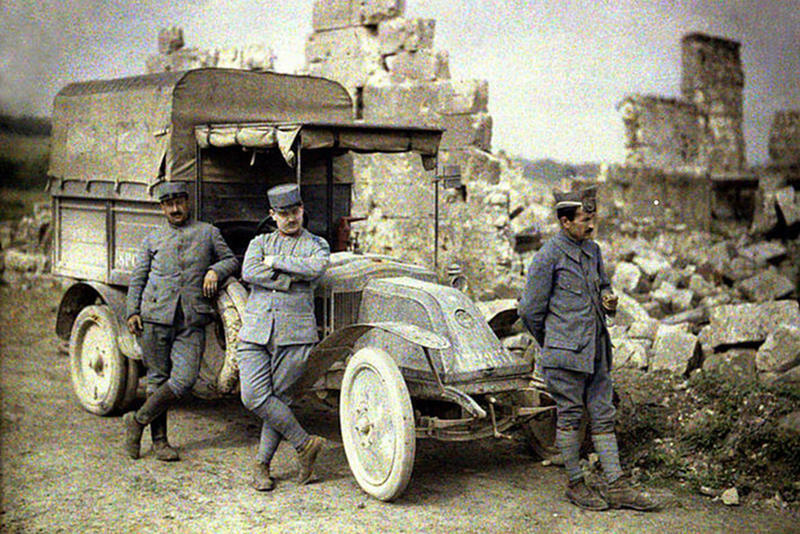 Three French soldiers in front of their truck beside a heavily damaged building in Aisne. 19. 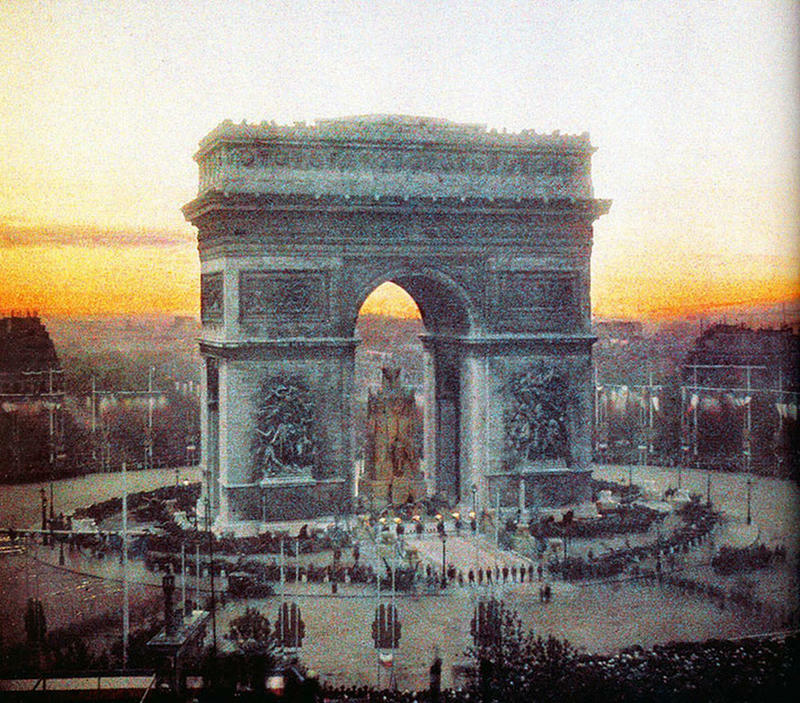 Victory celebration at Arc de Triomphe in Paris, July 14, 1919. 20. 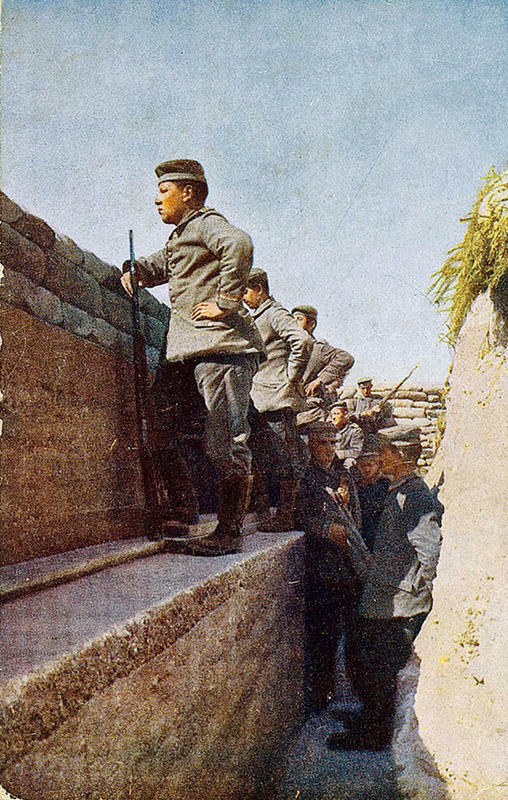 Soldiers pose in a concrete trench. 21. 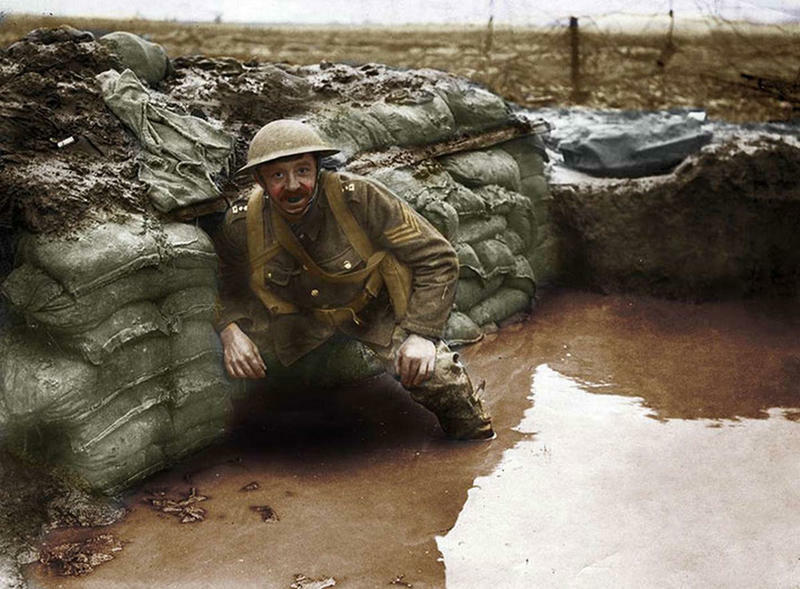 A Lancashire Fusiliers seargeant in a flooded trench opposite Messines near Ploegsteert Wood, January 1917. 22. 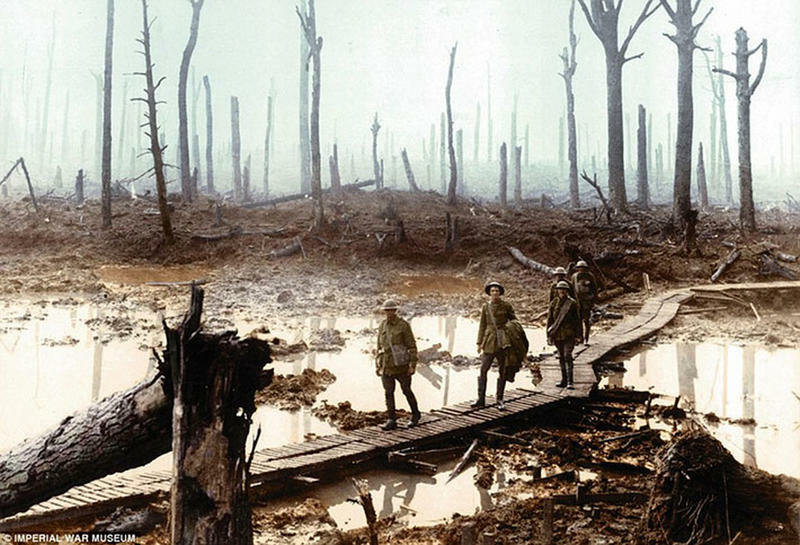 Troops walking along a duckboard track through the remains of Chateau Wood, Third Battle of Ypres (Passchendaele), October 29, 1917. 23. French officers of the 370th Infantry Regiment pose in the ruins at the Chemin des Dames near Reims, 1917. 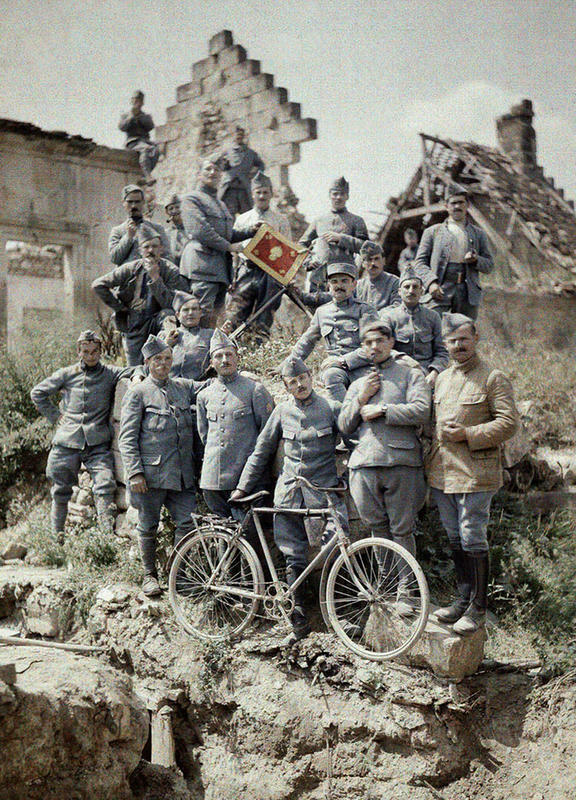 They have a bicycle and their Infantry Regiment flag. 24. 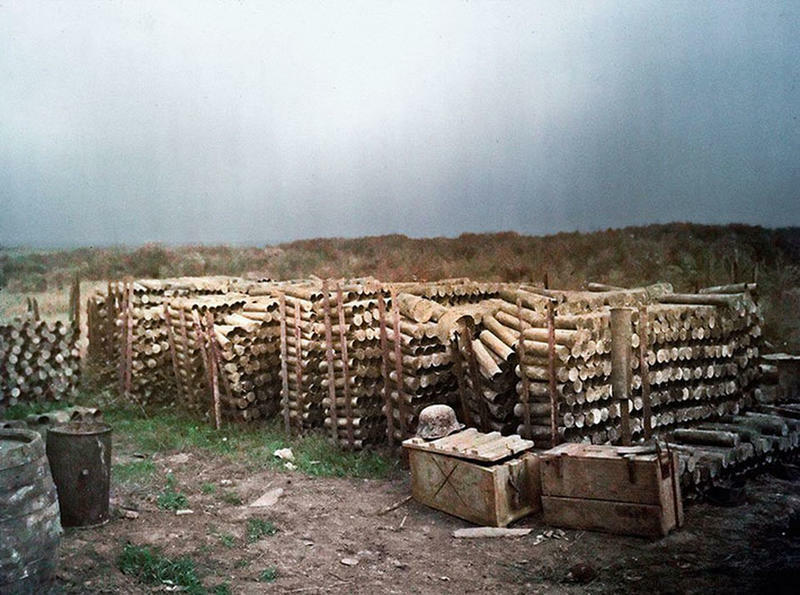 Ammunition depot in France, 1918. 25. 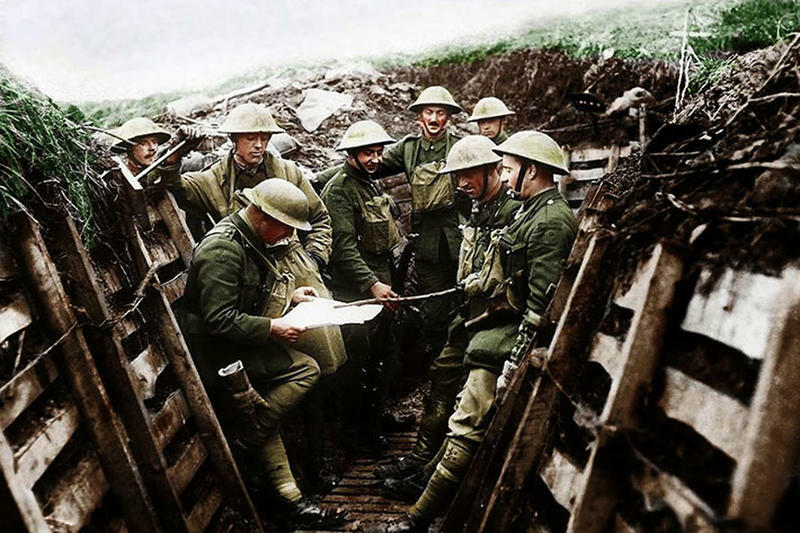 Soldiers from the Kings Liverpool Regiment in their trench listening as news is read out to them during World War One, 1918. 26. 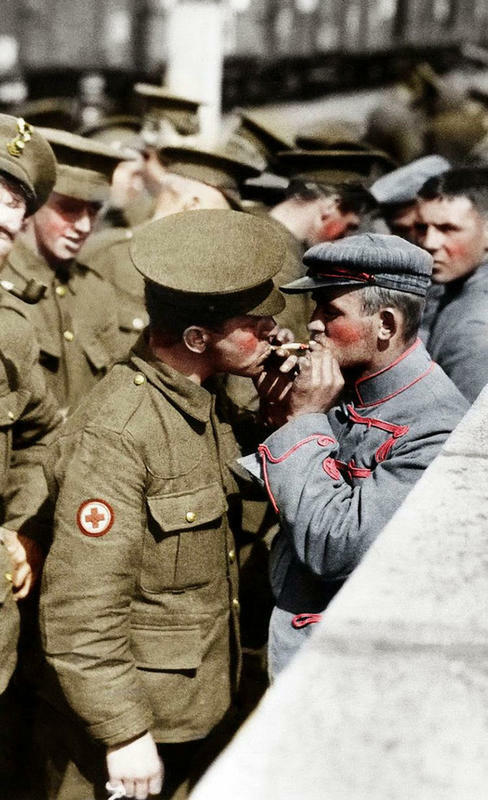 British soldier giving a light to a German prisoner of war, September 1914. 27. 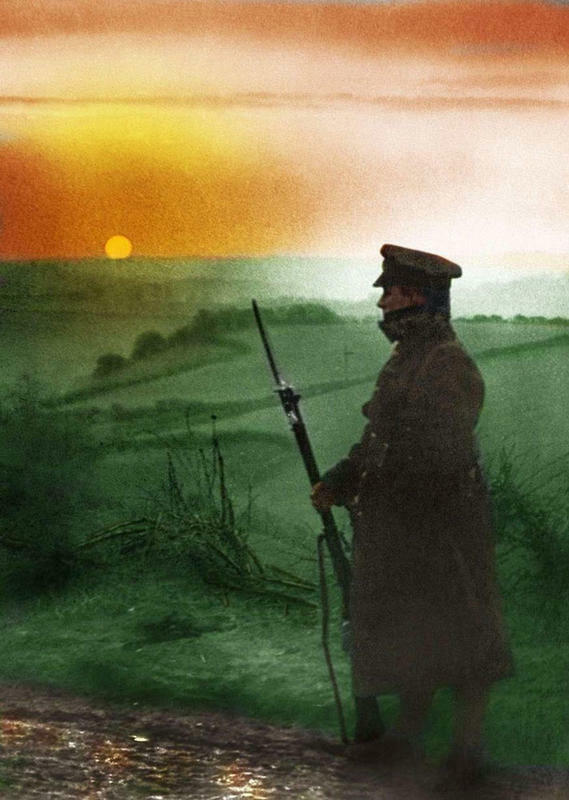 A lonely figure of a British sentry standing at his post. 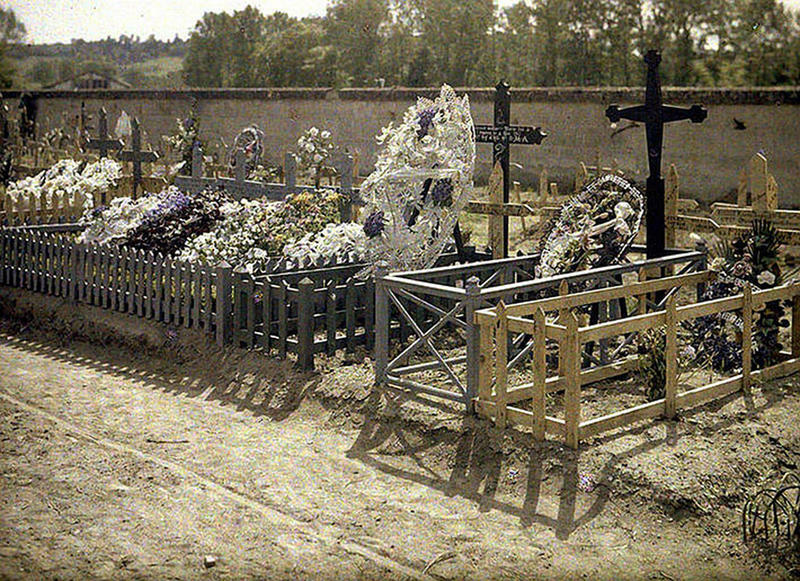 The picture was taken "somewhere in France" on March 20th 1915. 28. 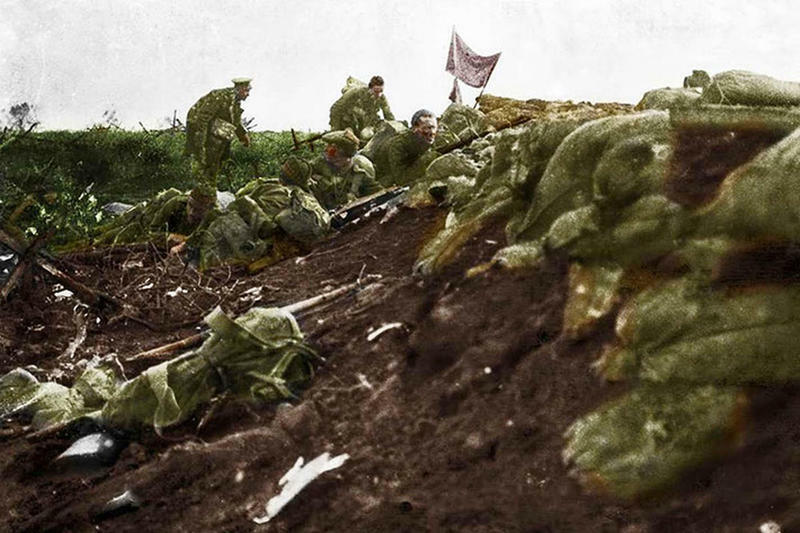 Members of the Scots Fusiliers take cover in front of a German trench they had just charged and captured, 16 June 1915. 29. A British Cavalry Scout on alert. 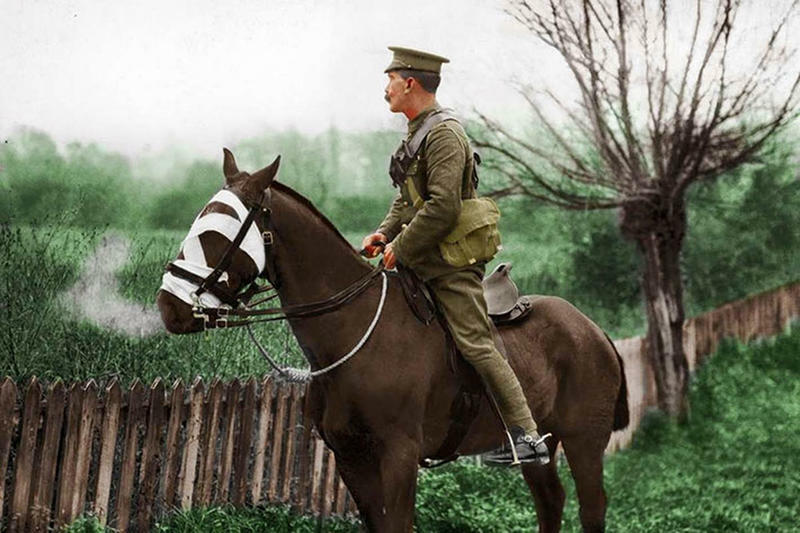 This image shows the care the soldiers take of their horses, for although the horse has only a slight injury he is well bandaged. November 1914. 30. 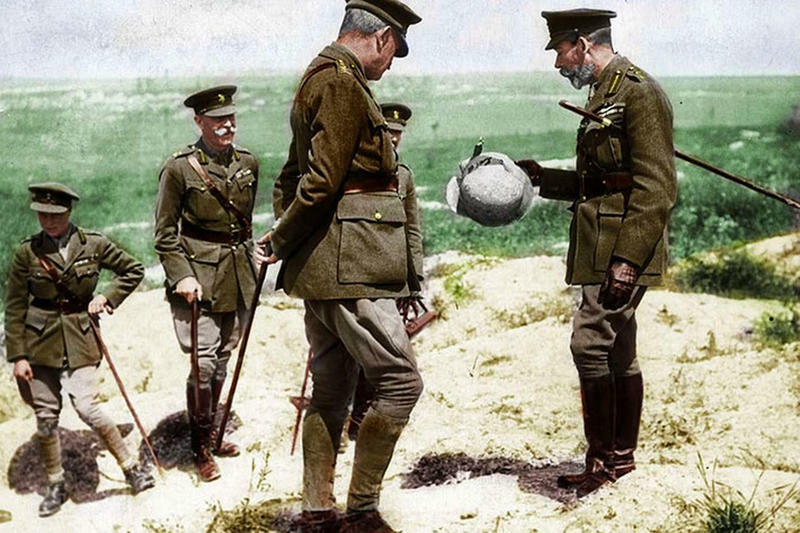 King George V picks up a Boche helmet on his visit in the Western Front, France. 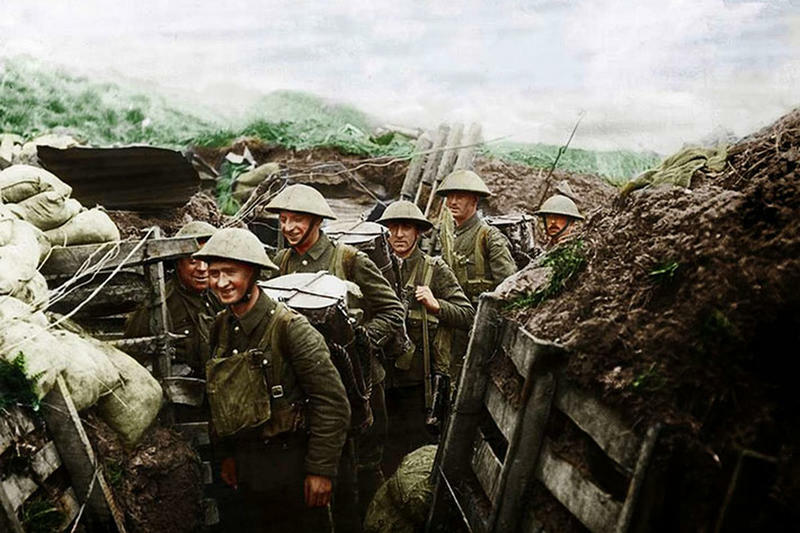 World War One. 26th July 1917. The King . 31. Carrying party of the 1/7th King's Liverpool Regiment, 156th Brigade, 55th division. They bring up rations in containers to the soldiers in the trenches in the La Bassee Canal Sector, 15 March 1918. 32. 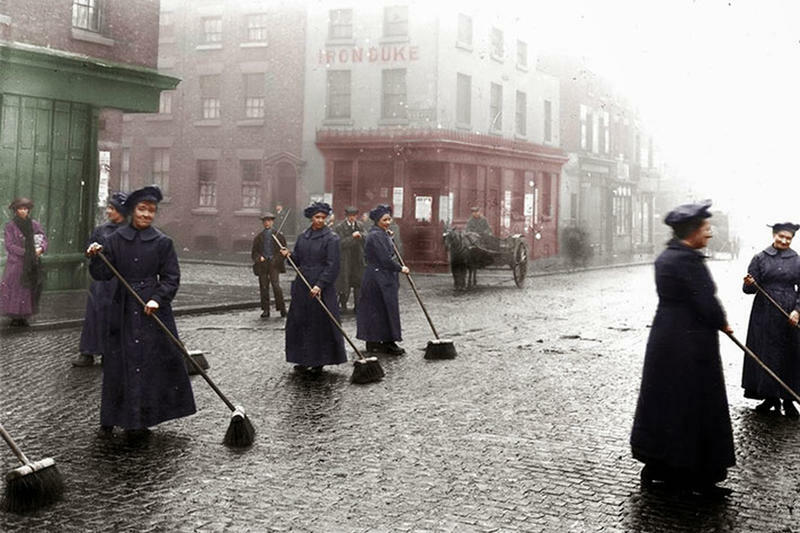 Female road sweepers cleaning the streets of Liverpool while the men are away fighting, 21st March 1916. 33. 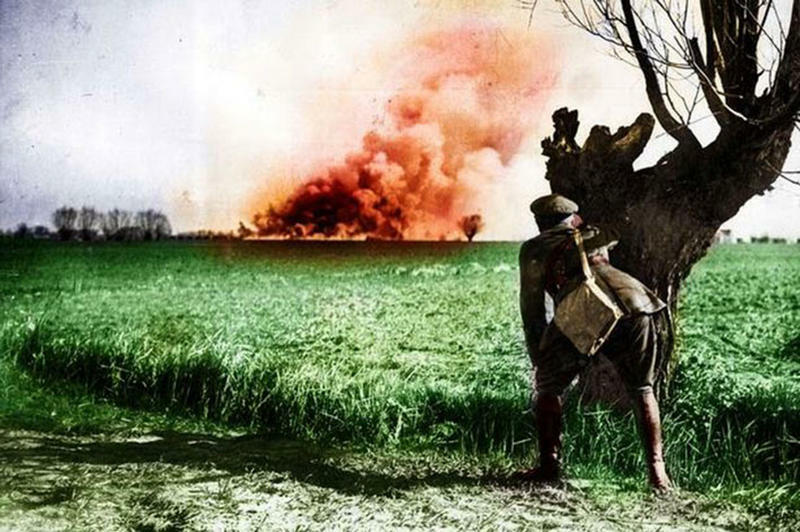 A British official observes from a distance the destruction of an ammunition dump before retreating from the advancing German army, April 1918.